From the 1890s until the 1930s, an electric streetcar system crisscrossed San Francisco and provided citizens easy and ample transportation to and from work and play. The postwar wealth of the 1940s, a boom in automobile production, and subsidized roadways gave birth to the automotive age and killed electric streetcars as a practical transit system in San Francisco. Rail transit moved underground into the BART and MUNI subway systems and ground transport was replaced with diesel buses. At the end of the 20th Century, San Francisco saw a limited return to light rail vehicles. "This morning was just like any other, I got on the streetcar at the corner of 18th and Guerrero, only a half block from my apartment near the YMCA and went to work in a warehouse near Folsom and 3rd, only a block from the end terminal. I was early today so the crush of people wasn't too bad. I read the paper. On my way home it was beautiful and sunny and the open ends of the car were jammed with people happy for a breeze. I stopped at the corner store to buy some milk and walked up to 3rd floor apartment that I share with my family. Today is October 12, 1930." This sort of commute used to be easy, up until October 5th, 1935 when the last #33 line streetcar ran in San Francisco. Most of the numbered bus lines in San Francisco used to be electric streetcars, forming the backbone of the city's transportation system. In the 1930s and '40s the electric streetcars were replaced by cheaper, ostensibly superior buses. Until the mid-1930s, two distinct public transportation systems operated in San Francisco. The first, the Market Street Railway, was privately owned, and became United Railroads in 1902. The other was created in 1892 by the voters of San Francisco, who incorporated it into their new city charter. Though the new system did not begin operation until December 28th, 1912, it was the seed for the present day MUNI. Between the great quake and fire of 1906 and the absorption of United Railways into MUNI in September of 1944, The City was covered by railway lines. All of the streets south of Market to Townsend had a spine of streetcar tracks, and Market Street alone had four tracks: two for United Railways and two for the city-owned and operated MUNI. The trip cited at the beginning of this article was quite easy, and could be accomplished via several routes; thus a malfunction on one line did not force people to walk to work, or else find another form of conveyance. The only areas not adequately covered were sectors of the outer Sunset, and the Excelsior, districts which were both undeveloped at the time. 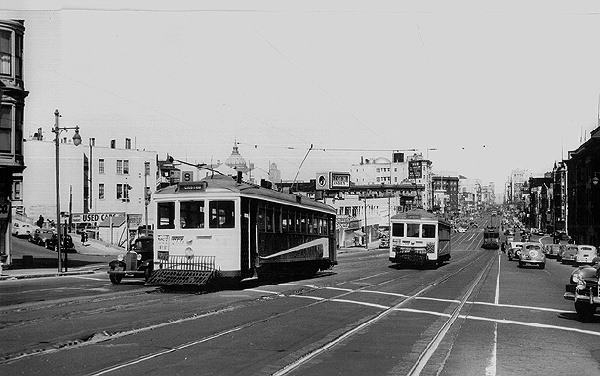 In San Francisco the streetcar was not just how we got to work, it was also how we got to play. Instead of taking the N Judah (if you can find one) to Golden Gate Park, there were two streetcar lines that bracketed the park. You could take the #7 along the south and the #5 along the north. Both terminated at Ocean Beach. If you wanted to go to the Chutes at the Beach, a popular place on weekends at the time, you could take either of these routes and not worry about parking. During the peak of the summer season there was service every five minutes to the Sutro Baths via the #2 line. As in many cities throughout the U.S. the automobile and America's post-WWII prosperity helped to destroy -- in many cases completely -- the nerve centers of formerly vibrant cities. There is always talk of the conspiracy by Goodyear, GM, and the oil companies to do in the streetcars though their subsidiary National City Lines. In San Francisco the near demise of the streetcar was mostly self-contained. At the beginning of the twentieth century streetcars were big business. First demonstrated in the late 1880s in Richmond, Virginia, the electric streetcar was considered a utopian vision of using technology to solve problems. It was no longer necessary to walk (which is how most people went short distances at the time). People could work in one neighborhood, live in another, and take the streetcar between the two. Many of the streetcar systems in the U.S. during the early 1900s-1920s were built by real estate speculators trying to sell land and houses. The Key System in Oakland (now AC Transit) was built for this purpose. Streetcars were big business, but they had to deal with city bureaucracy as well. Cities trying to get a handle on the streetcar barons (as they were then called) severely regulated service and fares as well as dictated technical issues. Streetcars from San Francisco, and many other cities, had very slim wheels compared to their heavier rail cousins. This is because a streetcar company had to maintain not only its own tracks but the roadway they ran on. A wheel much wider than the rail would chew up the road sooner and cost the company more money. Of course, thinner wheels gave a poorer ride. By the end of the first half of the twentieth century most streetcar companies were already bankrupt from competition with autos and buses running on heavily subsidized roads. A further complication was created in San Francisco by the city's own streetcar lines, run by MUNI. MUNI built its own lines with taxpayer dollars, voted in by bonds, and could secure the best routes for itself in competition with United Railways. The city could afford to dig the massive tunnels that connect the East and West of the city. By the time United Railways disappeared its own tracks and cars were in such poor repair that MUNI decided to scrap them all and replace them with buses. The buses they used are electric because the city gets its power cheaply from Hetch Hetchy. If it were not for that we'd all be breathing a lot more diesel fumes than we already do. After the demise of United Railways the only lines that continued to be served by rail were the MUNI lines: J Church, K Ingleside, L Taraval, M Ocean View and N Judah. Until the 1970s all of these lines converged on Market Street and terminated in the Financial District. With the coming of BART and the MUNI subway, streetcars ceased to run on Market Street except for the antiques that were run on special occasions, such as the Trolley Parades. In 1990 work on the F line, which uses restored PCC cars from Philadelphia, was undertaken. The F line was the first "new" line built by MUNI in many years. It was also the first streetcar route in memory to replace a bus (the #8 Castro) and at the time of this writing, (1997) runs from Castro and Market, via Market Street, to the Transbay terminal. Construction is now underway for the F to travel as far as Fisherman's Wharf. The thinking is that this line will become a tourist line, but having ridden it on many occasions it seems to be used mostly by locals who are tired of sitting trapped in the MUNI subway, currently plagued by incessant problems and delays. Here at the end of the 20th Century it is possible that San Francisco may see a brighter transit future. Most of the people in the City discuss improving MUNI, and a group has even formed for just this purpose, named "Save The MUNI." Political will is its typical fence-sitting self, though some improvements, such as the extension of the J Church line out to Balboa Park, are now completed. MUNI still does not seem to understand how to maintain its buses or streetcars (now trendily called LRVs or Light Rail Vehicles), but the people who ride them know they are the lifeblood of the city; and that without them we'd all be sitting in gridlock for the rest of our lives. It is the people who ride on this system who are the key to its improvement. The heyday of the 1920s is gone, but if we remember that there was once a better way to get around we may see the birth of a superior transportation system. Trains?.. On the Bay Bridge!? !